1 gallon container of distilled water. 14 ounce bottle of Joy detergent. Ideally you want just plain old Joy. Avoid the antibacterial, special scented kind, or concentrated varieties. You just want plain old Joy dish detergent. 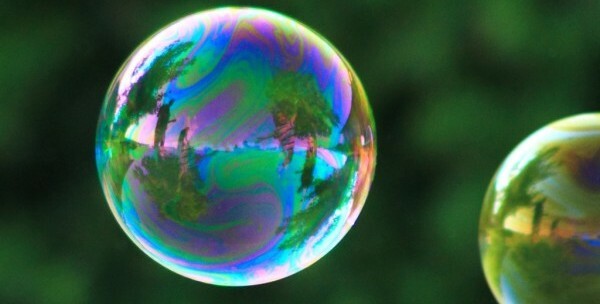 The KY has a special polymers (polyethylene oxide and others) in it that makes the bubbles last a long time in the air. Distilled water has very few dissolved impurities in it which helps make long lasting bubbles. Pour about 1/4 gallon of the distilled water into the clean empty pitcher. Squirt the entire bottle of KY Jelly into the 1 gallon plastic water bottle. Replace the cap and shake until nearly all the KY has dissolved. This is difficult, it will take a lot of shaking, probably 20 minutes or more. You can also shake for a while, let it sit, then come back and shake, etc. Gently pour in the Joy detergent. Try not to make a lot of bubbles or foam. Fill up the 1 gallon plastic container with the water you set aside in the first step. Gently rock the container to mix. Ideally, let this sit for a day. This allows any alcohols that are in the Joy to slowly come out of the solution. Many people make bubble wands from an old metal coat hanger (if you have any) by bending them into a loop. These will work much better if you wrap some string around the metal loop. Does not have to be completely coated in string, but the more the better. This will allow more bubble solution to stick to the wand as it soaks into the string.